LiveGrade Pro implements the entire ACES color pipeline including IDT transforms, working color spaces such as ACEScct and ACEScc, LMT, RRT and ODT transforms to be used on camera live signals on the film set. The ultimate goal is to create the same visual result on an on-set monitor (showing the ACES-processed live signal of a camera) compared to the monitors in a color corrector (showing the ACES-processed recorded source clips from the camera). The following diagram shows an example ACES pipeline as implemented in LiveGrade Pro. LiveGrade Pro implements this pipeline in the ACES (Academy Color Encoding System) grading mode. You can see the nodes and controls of the ACES grading mode in the screenshot below. On every interaction with the color controls of the ACES grading mode (e.g. change of IDT, modify of ASC-CDL) all transforms are baked together automatically and sent to the attached LUT box. LiveGrade Pro also offers the ACES CDL Advanced grading mode. This grading mode lets you add multiple grading nodes between the IDT and ODT and LMTs for advanced workflows. You can take a look at how to use the advanced modes in the article Grading Modes in LiveGrade. 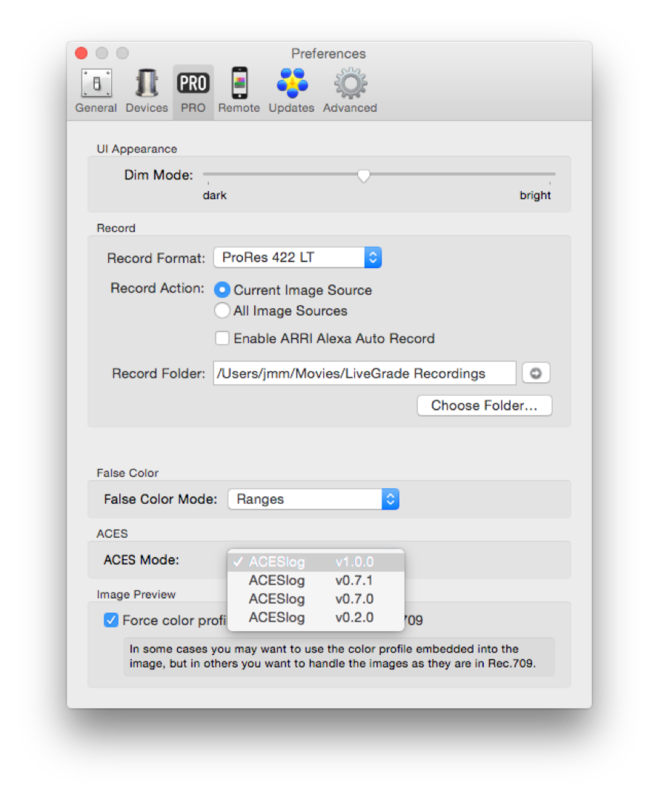 LiveGrade Pro supports multiple versions of ACES, including version 0.7.1, 1.0, and 1.1. For compatibility with the post production workflow please choose the right ACES version, as the transforms can be slightly different in different versions, and newer version usually include more and more recent input (IDT) and output (ODT) transforms, including RRT+ODT transforms for HDR in ACES version 1.1. Every look in the library made with an ACES grading mode has an associated ACES version (you can find that version in the “ACES Mode” column). Saving looks with different ACES versions to the library will make it easy to compare the look of different ACES versions effortlessly. With LiveGrade Pro the ACES grading mode can be used in different setups, e.g. with LUT-Boxes such as the Teradek COLR, FSI BoxIO or Fujifilm IS-Mini or directly with a monitor such as the Flanders Scientific DM250 broadcast monitor, that has processing capabilities included. LiveGrade provides the necessary IDTs for various “log” signals such as ARRI Alexa Log-C or ACESproxy signals. To learn more about the hardware setup of LiveGrade Pro see the article about HD-SDI setup for LiveGrade. Before starting to create your grades, select the correct IDT (matching your camera system) and the ODT (matching the output display color space) from the color transformation panel. LiveGrade Pro currently offers all officially (in the Academy’s repository) available IDT and ODT transforms, as well as a few custom transforms by Pomfort.